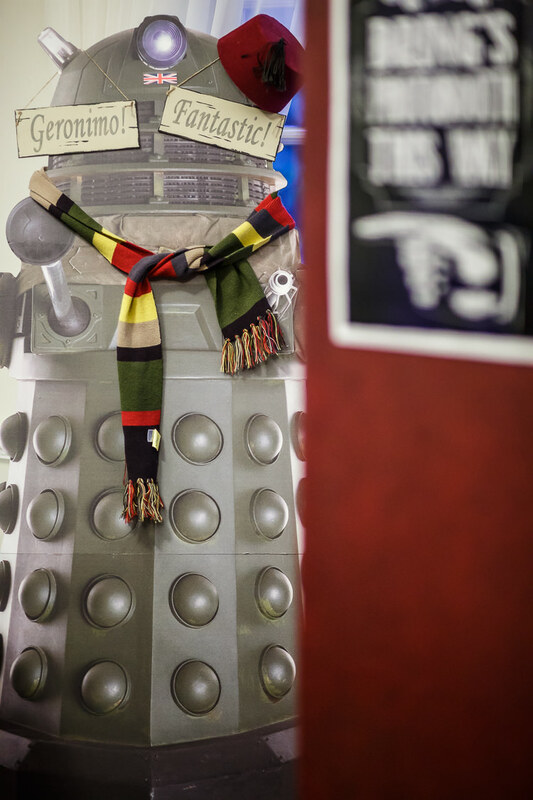 Yes you read right, this afternoon we’re going all vintage and Doctor Who themed. Excited much? 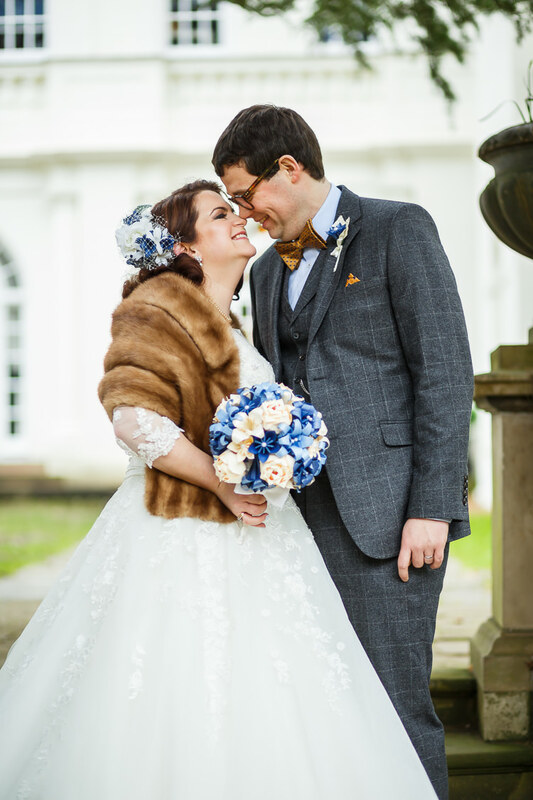 WWW readers Carrie-Ann and Christopher were hitched on the 13th February 2016 at Heatherden Hall, Pinewood Studios in Buckinghamshire. 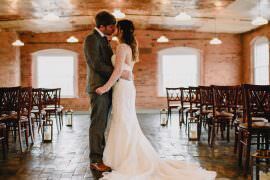 The studio venue suited their Doctor Who inspired nuptials perfectly and the wood panelled hall really worked with the 1940s vibes. Let’s begin with the uber stylish and very fitting attire. 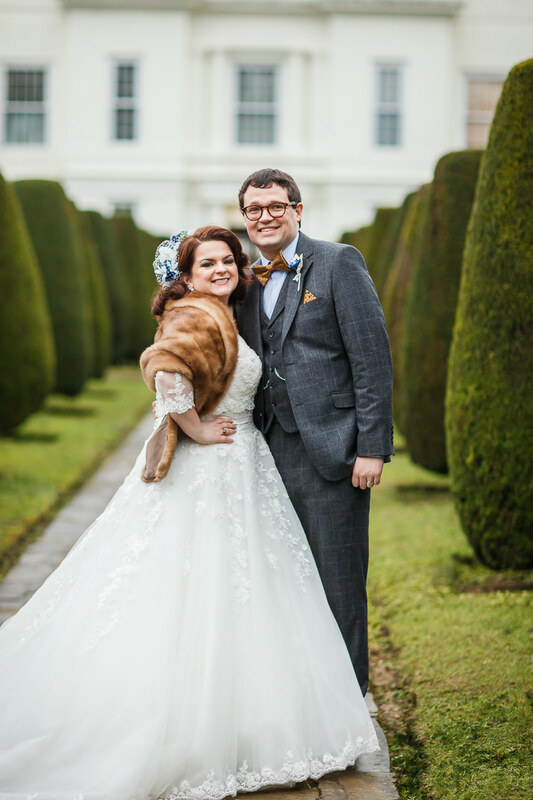 Christopher channelled his inner Doctor in a check grey suit with mustard bow tie for a super quirky look. 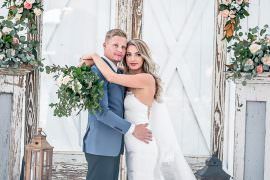 While Carrie-Ann wanted a timeless lace look, she chose a Justin Alexander dress and bolero with oodles of lace and a fur shrug for a touch of glamour. 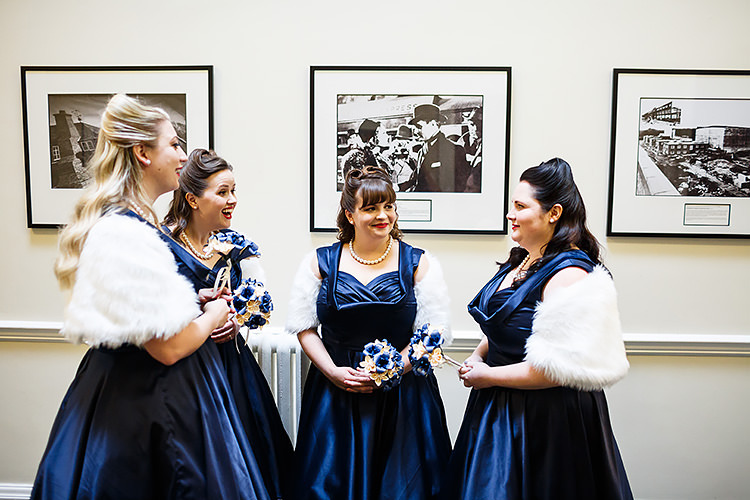 The bridesmaids also followed the vintage theme in navy prom dresses and victory rolls. 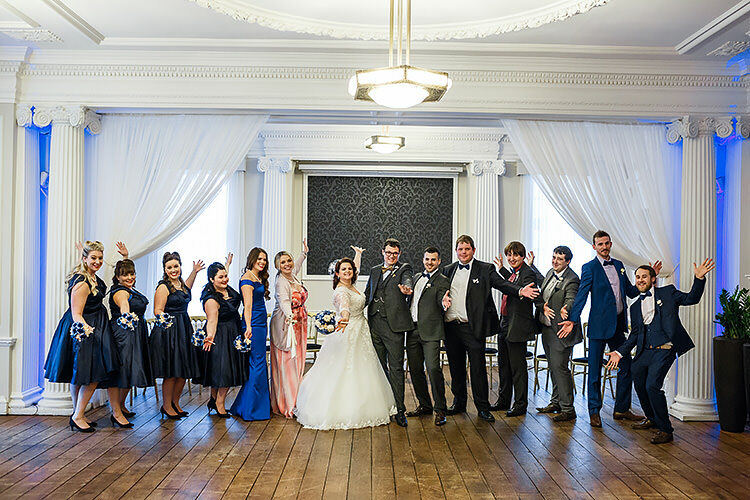 Didn’t they all look marvellous? 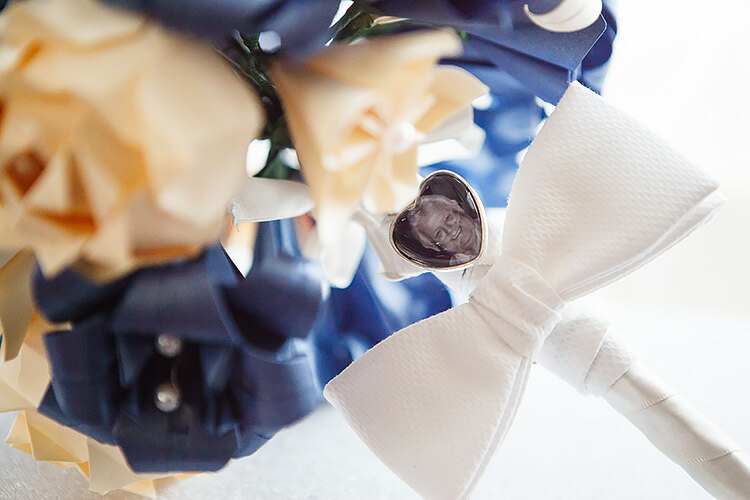 Touches included Tardis details galore; teapots filled with blooms, cake and socks to name a few. 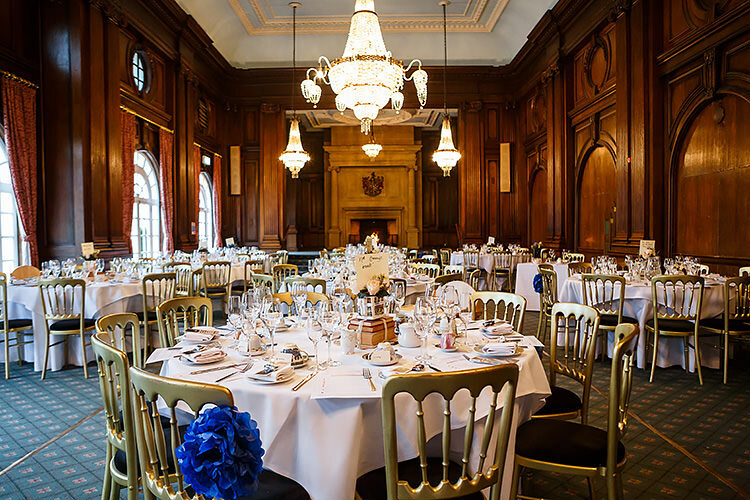 Guests were treated to afternoon tea, a hot chocolate stand and computer games to entertain. What a fantastic celebration all round. 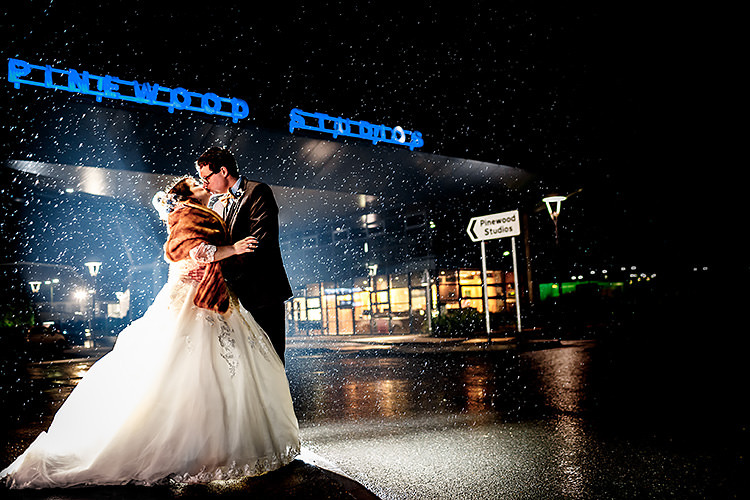 Lina and Tom, thank you both so much for sharing these wonderful shots. 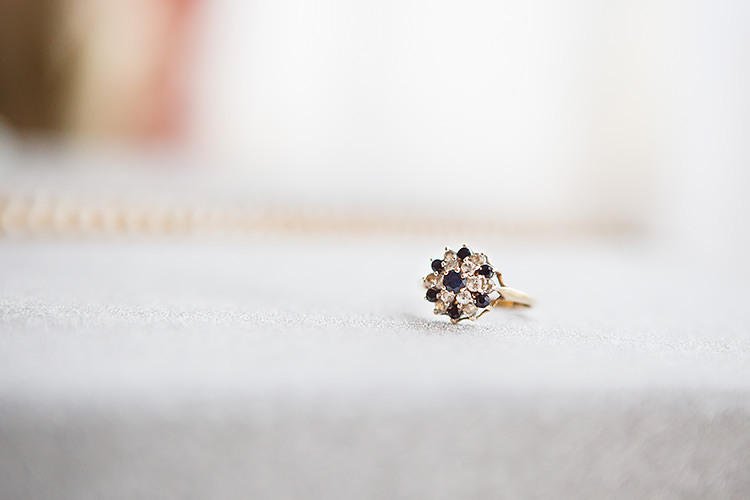 THE PROPOSAL | Just before Christmas 2014, Christopher took me to Canterbury, which is one of my favourite places in the whole world, and where I went to university. While I was at university, there was a really old fashioned building that I used to pass every time I walked into town, and I was desperate to go in, but thought it would be a bit odd, as it was a hotel. So Chris booked us a room there for a couple of nights as a ‘pre-Christmas treat’. The rooms all have names, and Chris booked us into the Paris room, named after another one of my favourite places. We were walking around the town, and decided to go back to the room to defrost, when Christopher told me he had a present for me, before passing me a copy of the magazine he edits. I must have looked confused, as he told me to open, it, and there was an edition of ‘The Carrie-Ann Times’, with a picture of a very young me on the front. I opened it up, and the first headline was him asking me to marry him. When I looked up, he was on one knee, and with the force I threw myself at him with, I’m very surprised he didn’t fall over! After I’d calmed down, we sat down to read through the rest of the magazine together. 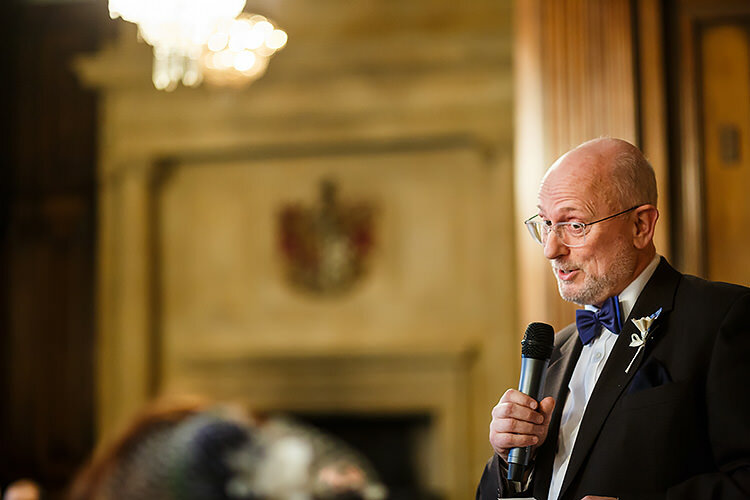 His article talked all about how we first met (we were at school together, although we got together much later), and he’d also asked my family and best friends to write short articles about me – it was hands down, the nicest thing anyone has ever done for me. He later told me that he’d been planning to propose to me on a bench in Westgate Gardens, because I once told him that me and my housemate used to go there to read magazines and drink Diet Coke when the weather was nice, but thought I might have been complaining about frostbite too much for it to be romantic. 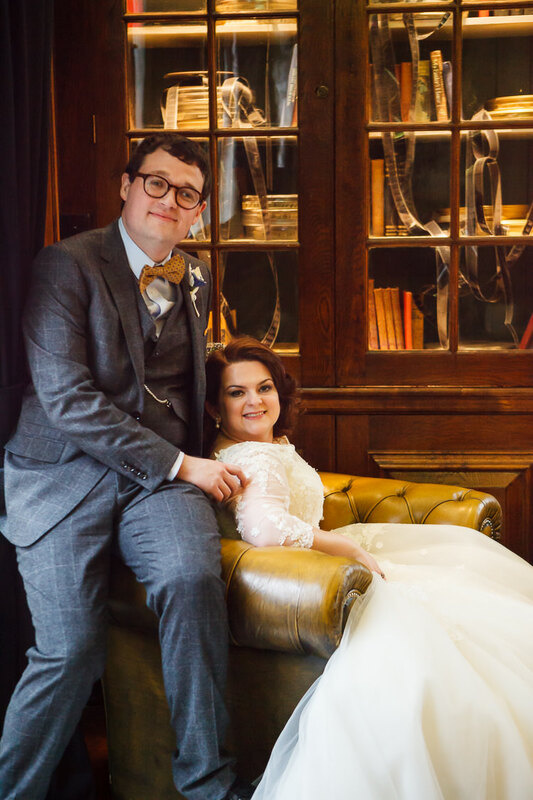 He also told me that my sister and his mum had helped to choose the ring, meaning they’d both been keeping a pretty big secret from me for around six weeks. 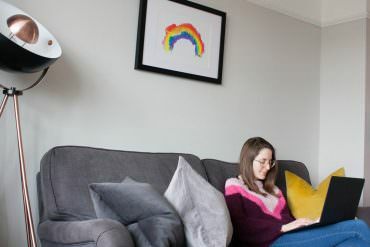 THE VISION | We knew we wanted to reference Doctor Who – Christopher is a massive fan, and although I’d never seen an episode (and was content for it to stay that way) before we got together, I asked him if we could watch one together so I could see what all the fuss was about, and was instantly hooked. 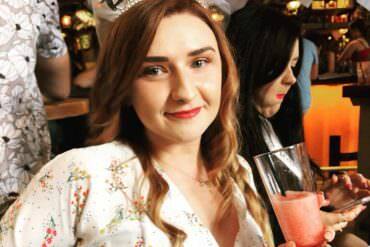 I love all things vintage (especially the 1940s and 1950s), so we were really keen to see how we could combine the two. 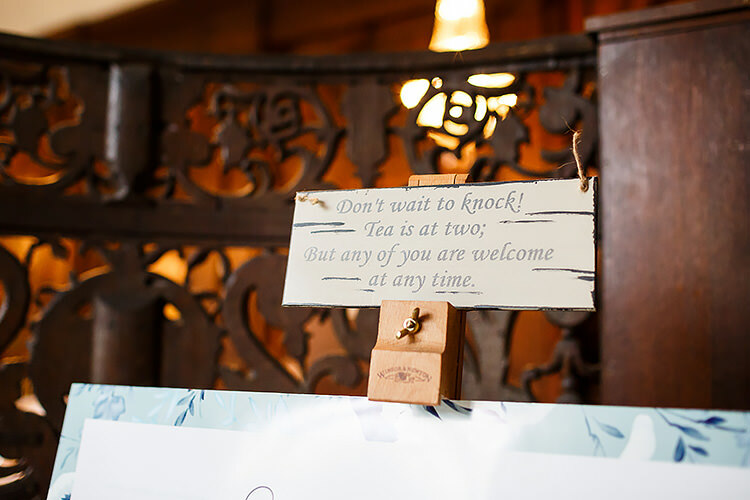 We also decided early on that we didn’t want a traditional, three-course dinner, and as Christopher loves tea, and I love scones, afternoon tea was the obvious choice for the wedding breakfast. 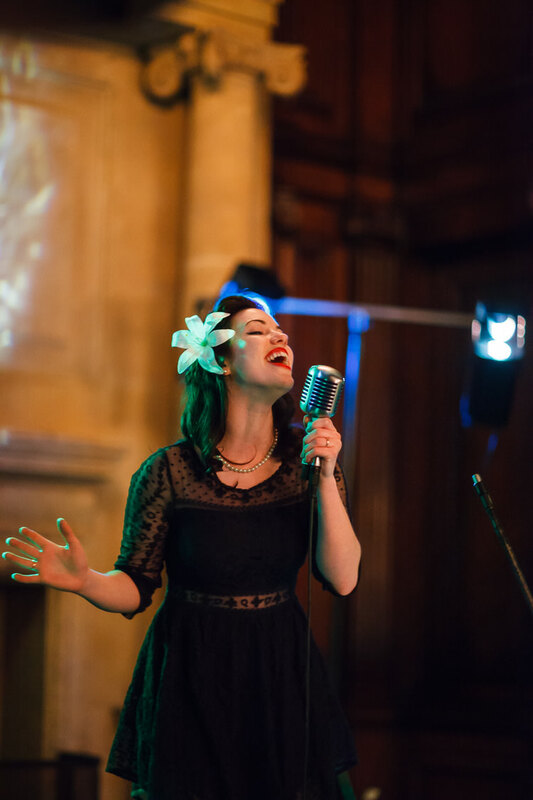 We originally had a different venue, which was much more 1940s, but unfortunately they cancelled our booking with about six months to go. 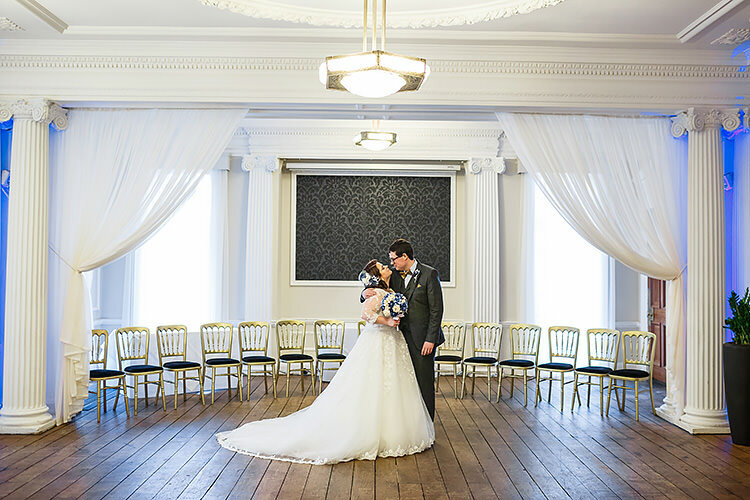 Although it was incredibly stressful at the time, it led to us finding Heatherden Hall at Pinewood Studios, which was recommended to us by a few people (including our photographers, who have a lot of experience in the industry). 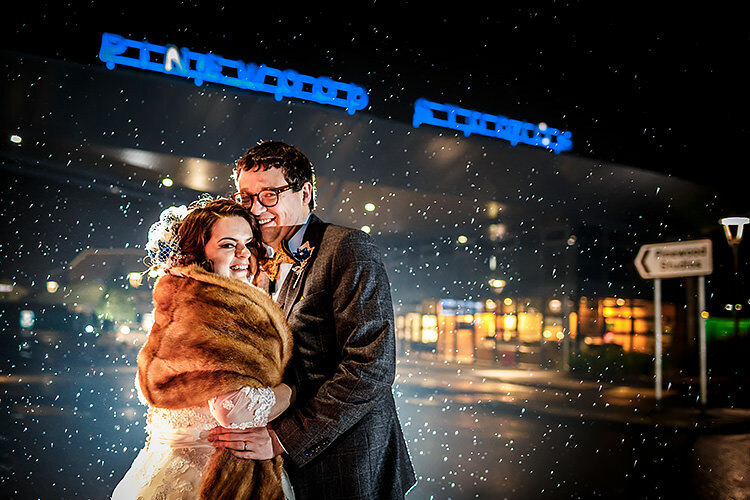 As soon as we went under the famous Pinewood Studios sign, we were pretty much set on the venue, and they really aided us make our vision a reality, helping us to mix vintage and Doctor Who into one bundle of awesomeness. 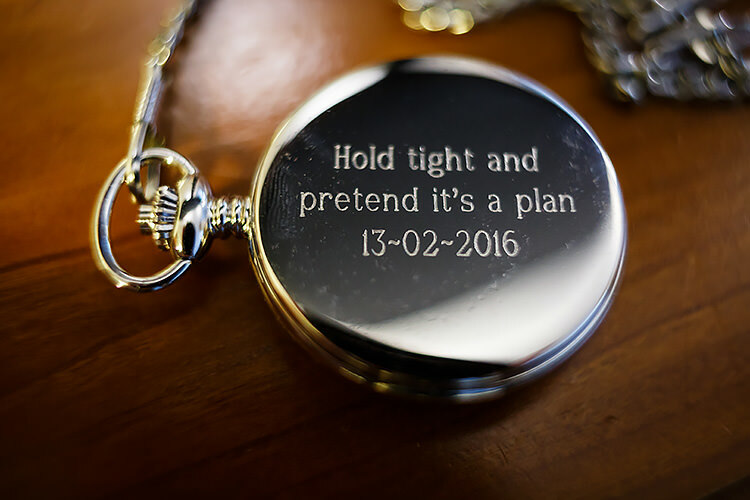 THE PLANNING PROCESS | After setting our date, we decided to take two months to enjoy being engaged, giving us 12 months to plan. 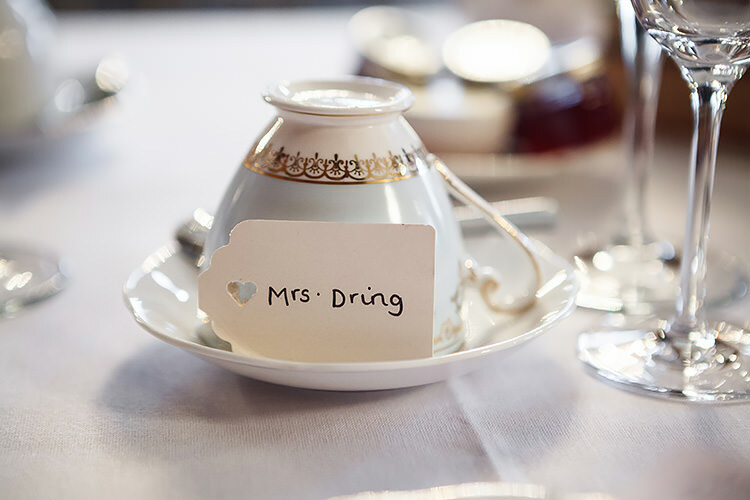 We also decided to buy all the crockery for the afternoon tea ourselves, which was a really nice way to spend time together doing something for the wedding. Although there were several moments where we panicked we might not have enough to go around, we muddled through with car boot sales, charity shops (Christopher’s mum had a knack for finding beautiful teapots) and my mum visiting a lot of auctions! 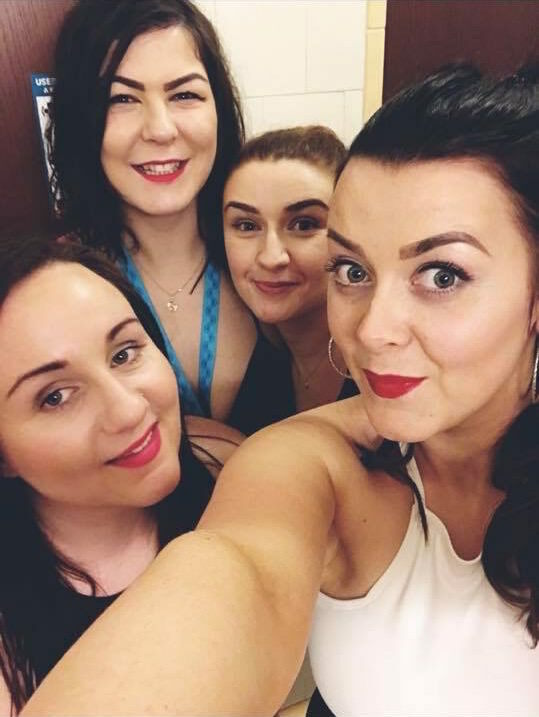 We were very lucky that we have lots of extremely talented and kind friends and family members, who wanted to be involved. My cousin offered to design our wedding invitations for us, which were absolutely gorgeous (she also ended up printing and shipping them for us from the US, as oddly, that cost less than printing them in the UK). 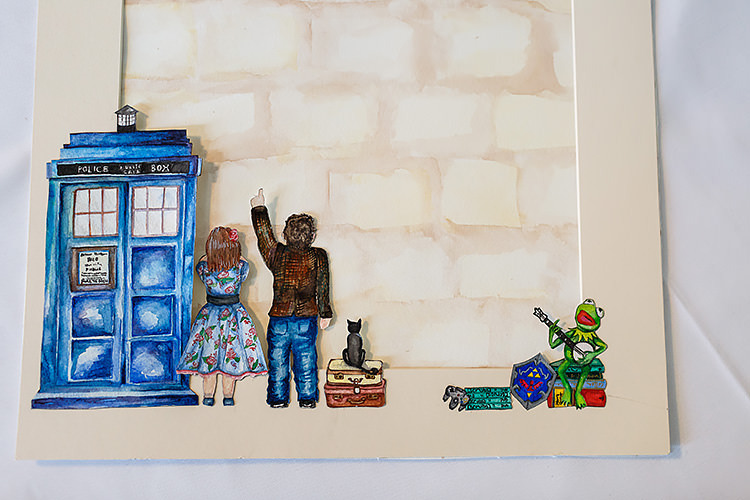 Another talented friend painted a canvas for us for people to sign, which referenced all of our favourite things, including books, my 1950s dresses, Christopher’s tweed jacket and, of course, our cat. 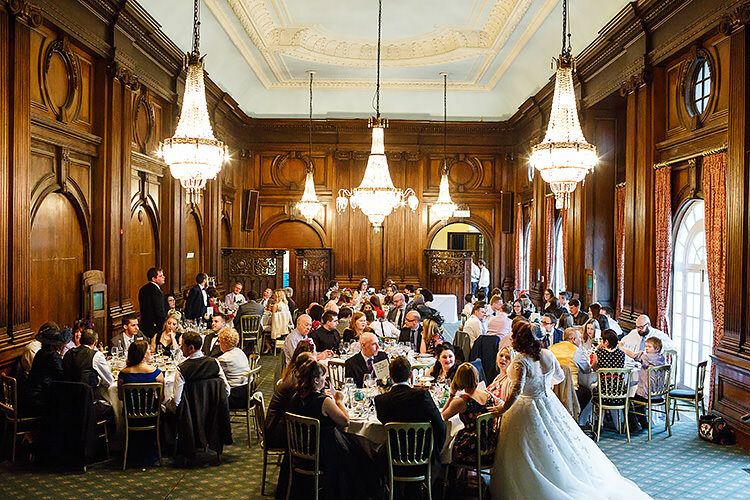 THE VENUE | Heatherden Hall at Pinewood Studios, Buckinghamshire. 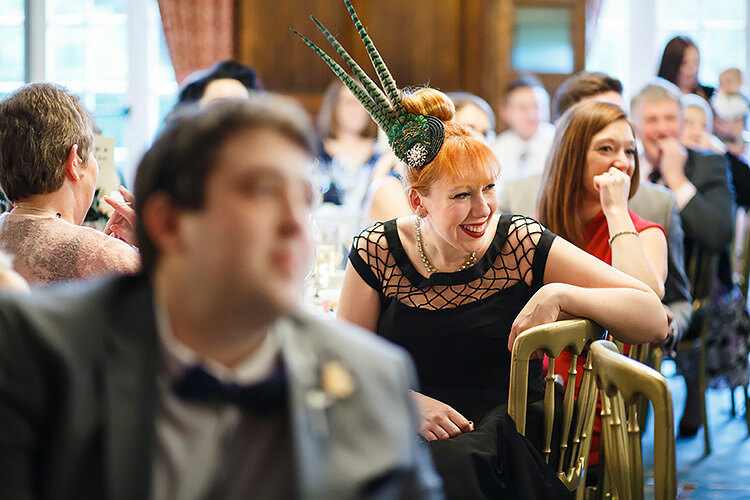 THE DRESS & ACCESSORIES | I wore a customised Justin Alexander dress and bolero, which were sewn into one piece with a custom What Katie Did corset underneath which has TARDIS blue boning. 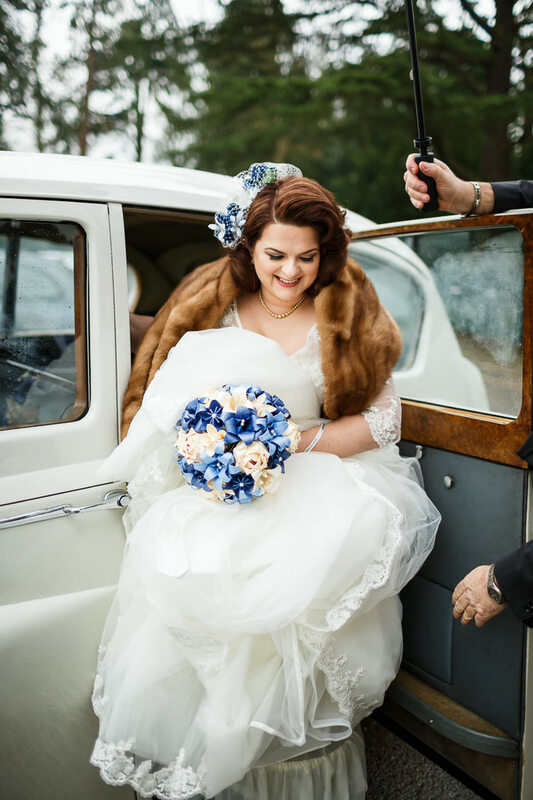 I didn’t want a long veil, because I wanted to show off the lovely back of the dress, and I’ve loved Rosadior’s hairpieces and hair flowers for a long time. I told her my theme and colours, and she came back with lots of different options – I loved the one I wore right away. One of my bridesmaids took me shopping for wedding accessories, and very kindly bought me my pearl drop earrings as a wedding gift, while my other jewellery (string of pearls and sapphire ring) belonged to my gran. My shoes were the perfect mix of vintage and Doctor Who, as they’re from a company that makes reproduction vintage shoes, and the navy sparkliness reminded me of a starry night (the colour is even called ‘Night Sky’). 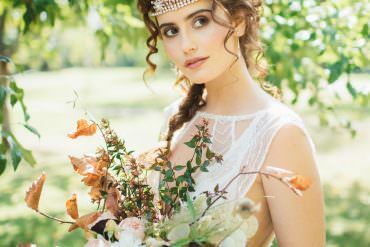 FINDING THE DRESS | I found shopping for a wedding dress incredibly stressful. 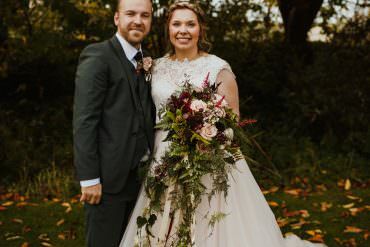 Short and curvy, I struggled to use the requisite amount of imagination to see myself in a dress that was miles too long and too small (seriously, bridal shops – look at your range of sizes!). I knew I didn’t want a tea-length dress, as I wear those every day, but I wanted something with lace, sleeves and had a romantic vintage look about it – my dream wedding dress is Grace Kelly’s. 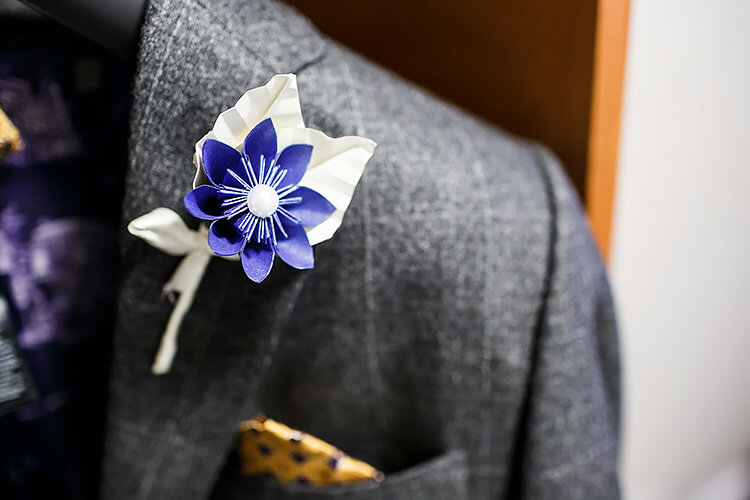 I tried on all sorts of shapes and styles in a few different shops, but it wasn’t until I went to Shades of White in St. Ives (Cambridgeshire) that I found ‘the one’. 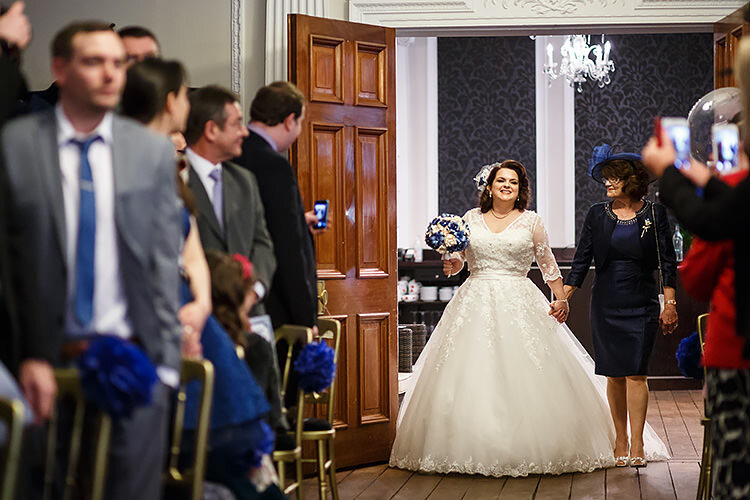 This trip was also the first time my auntie had come wedding dress shopping with me, my mum and my sister, so we like to call her our lucky charm. After trying on a mermaid shape (because I’d heard the advice you should ‘try something you never thought you’d try’ – except I hated it, exactly as I’d expected), and a Bardot neckline which was gorgeous on the hanger, but left me looking a bit… square, I spotted a lace and tulle Justin Alexander gown, which I absolutely adored, except it was sleeveless, and I really wanted sleeves. 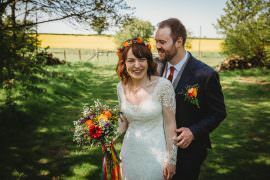 The staff were absolutely fantastic, and after adding a bolero (and having to use that pesky old imagination again), that was it – I’d found my dress and I didn’t ever want to take it off. 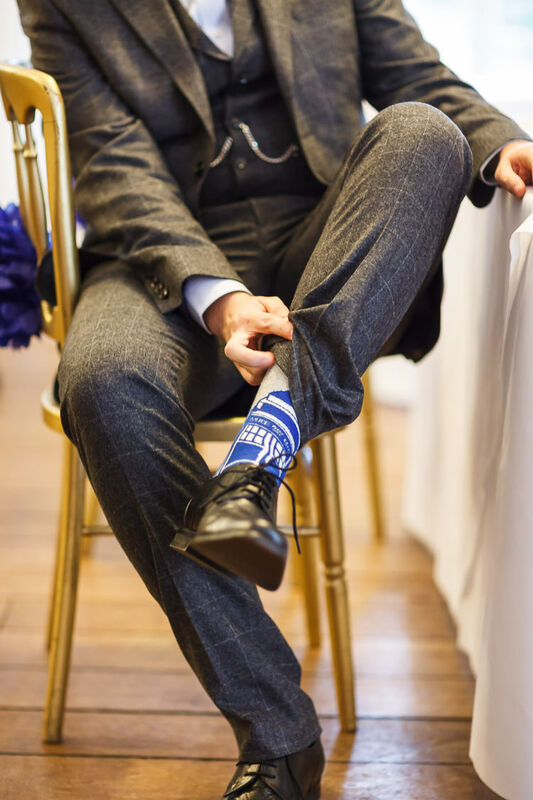 GROOM’S ATTIRE | Christopher knew he wanted something that made him look a bit like The Doctor. Except not cosplay – something that The Doctor might wear if, you know, The Doctor was him. 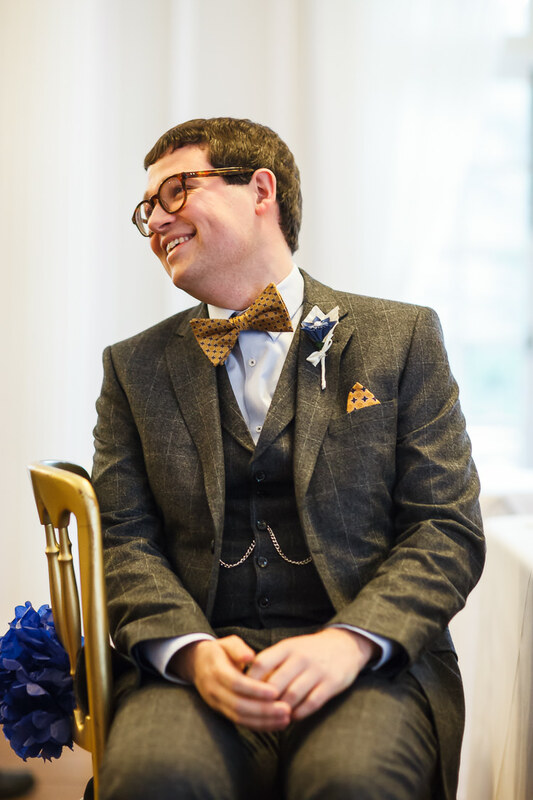 After a couple of disappointing shopping trips where he came back empty handed, he and one of the bridesmaids headed over to Milton Keynes, where he picked up a three-piece Ted Baker suit (including TARDIS-style phone box pin), Moss Bros bow tie, and light blue shirt from Next. We got a bit of a bargain with his shoes, which are from Rachel Simpson’s eBay shop. THE READINGS & MUSIC | We wanted something non-traditional, and WH Auden’s ‘You’re my Cup of Tea’ was an obvious choice. 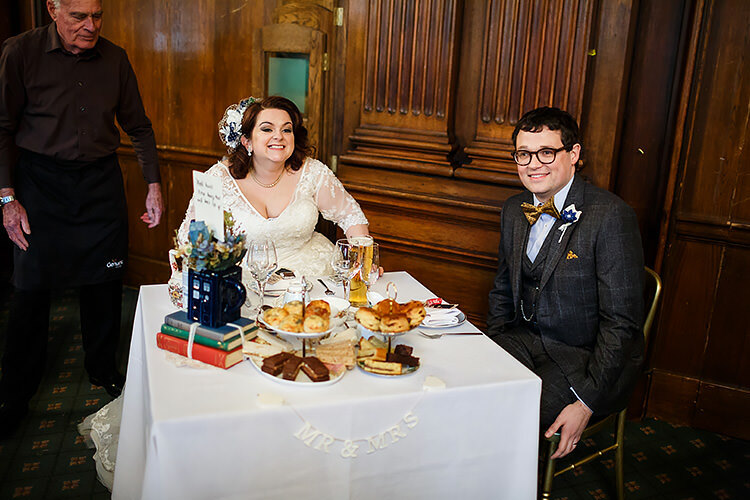 Christopher also loves Neil Gaiman, so when I was searching for unusual wedding readings and came across ‘The Day the Saucers Came’, I thought it was perfect. 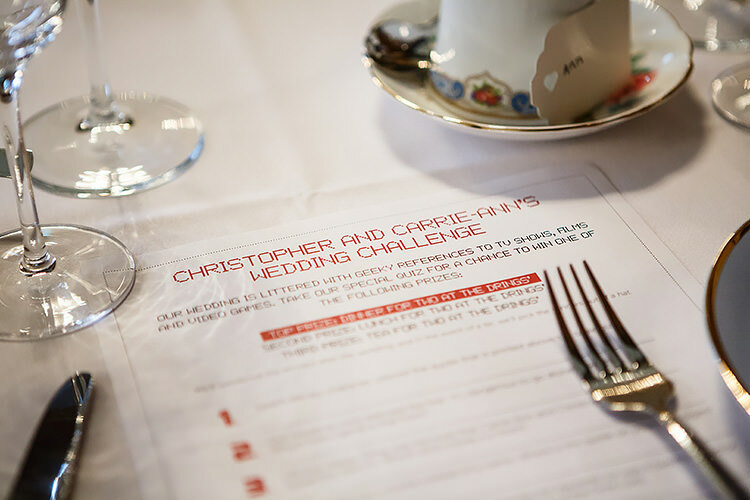 Ben, one of Christopher’s ushers, read it out, and his laugh when he tripped over the words and had to start again was one of my favourite moments. 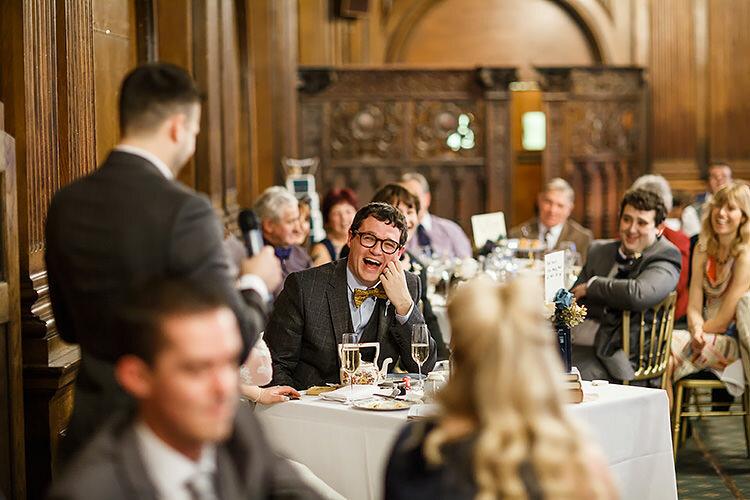 My brothers, Simon and Greg, read ‘You’re my Cup of Tea’, with Greg hobbling up the aisle on crutches as he’d broken his leg the week before the wedding. 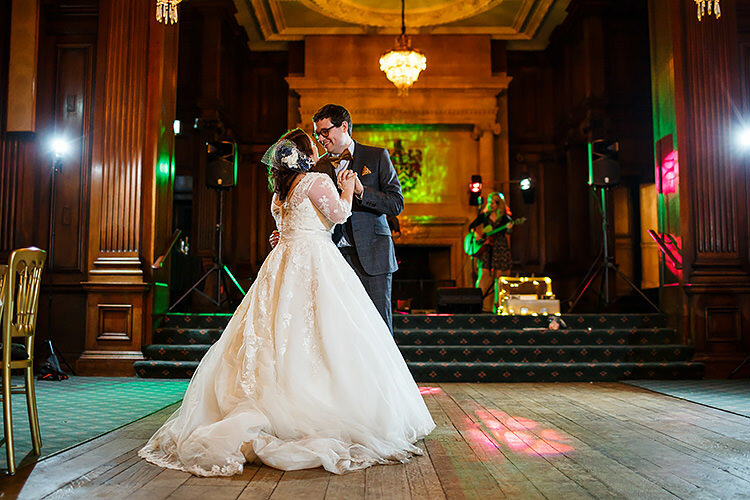 Before the ceremony started, we had a mix of music from Glenn Miller, The Legend of Zelda and Doctor Who, which I like to think gave everyone a pretty good idea of what to expect from the day! 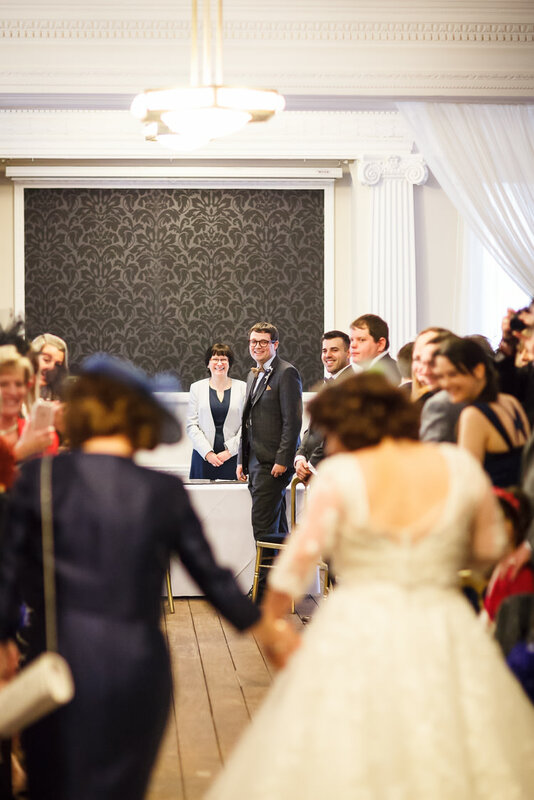 I walked down the aisle to ‘Clara’, one of the themes from Doctor Who, and we signed the register to the opening music from ‘Up’, which is rather aptly called ‘Married Life’. 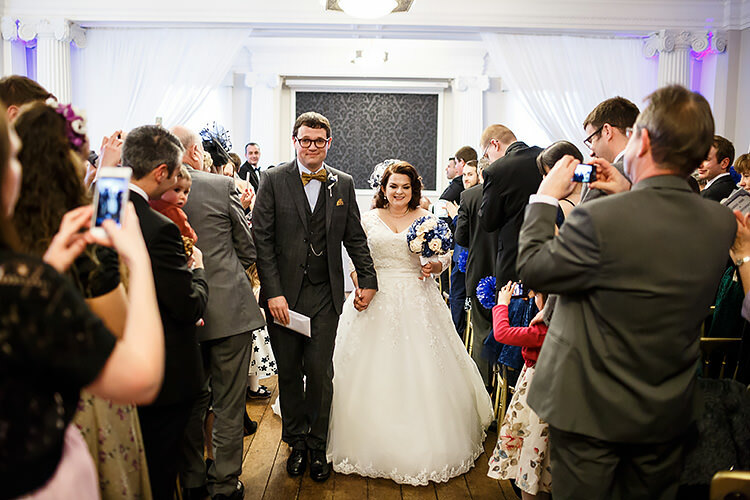 We walked back down the aisle to ‘Life’s a Happy Song’, from The Muppets, which is a song we sing (poorly) to each other all the time. 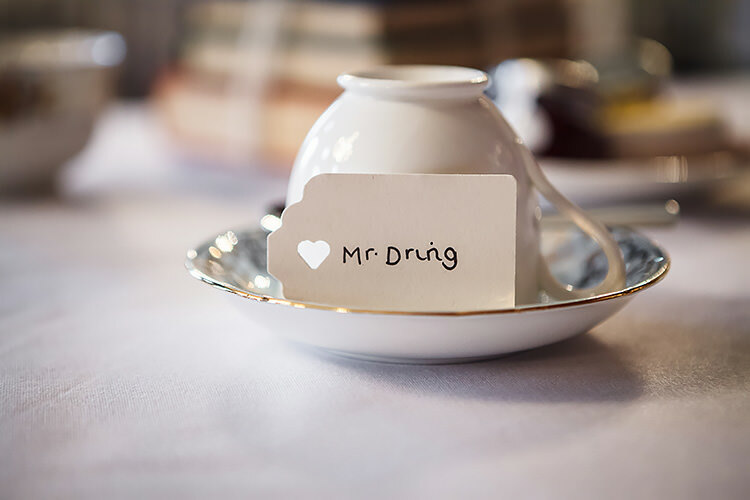 Over afternoon tea, instead of mixing the music, we decided to have songs from all our favourite television shows, which formed part of the ‘Wedding quiz’ (more to come on that later). This included the themes from Sherlock, Scrubs and Twin Peaks. 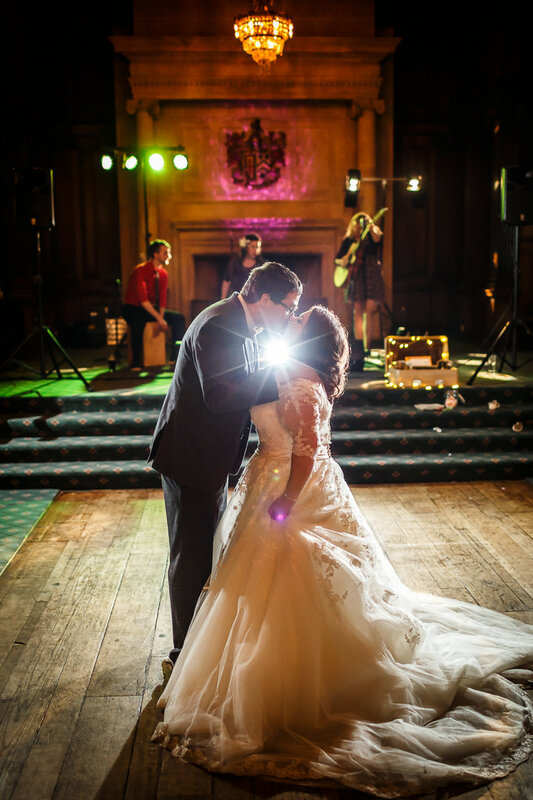 Then, in the evening, we had a fantastic band called Daughters of Davis, who played our first dance, ‘Stand by Me’. In between sets, Chris had created a playlist of all our favourite songs. 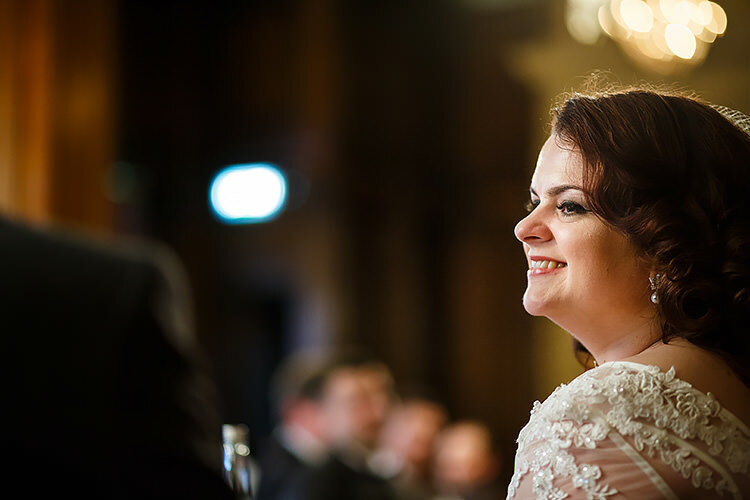 BEAUTIFUL BRIDESMAIDS | Sticking with the vintage theme, my sister, Katie, our maid of honour, wore a 1940s-screen siren style dress from Coast and Veronica Lake waves. 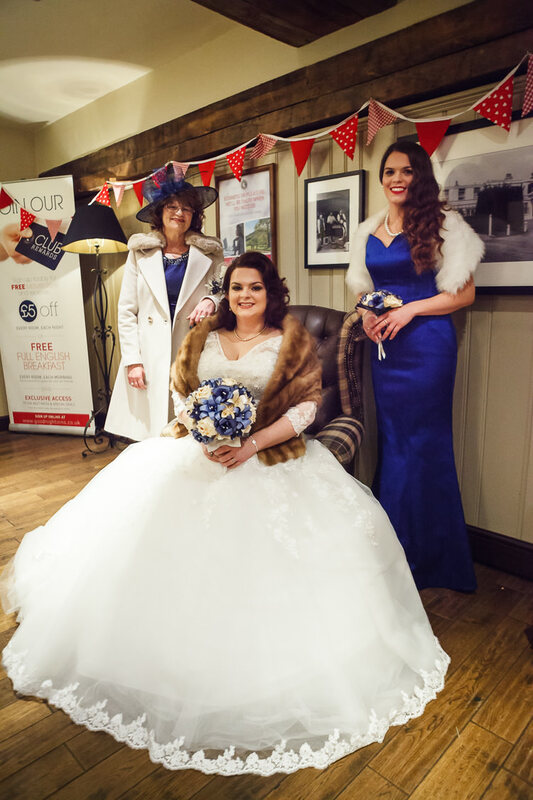 Four school friends – Christine, Catherine, Em and Fran – were bridesmaids, in 1950s swing dresses from Little Wings Factory, with petticoats underneath, with victory rolls and red lipstick. 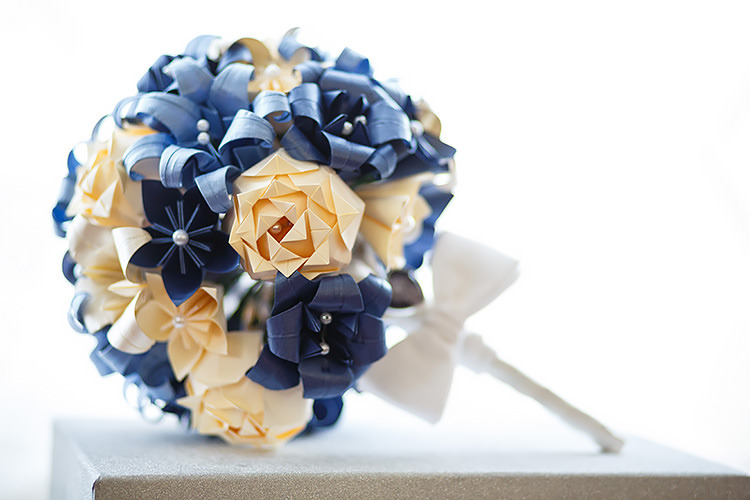 THE FLOWERS | We’re both avid readers (and writers), and wanted the flowers to be something the bridal party could keep, so we decided on paper flowers for the bouquets and buttonholes, from Lily Belle Keepsakes, which were just beautiful – exactly what I’d imagined. 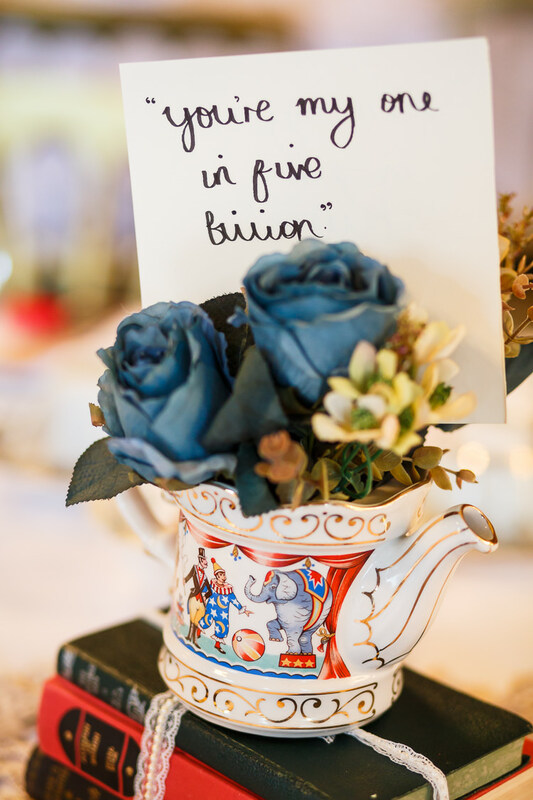 For the table decorations, we used silk flowers in teapots, for a vintage feel. 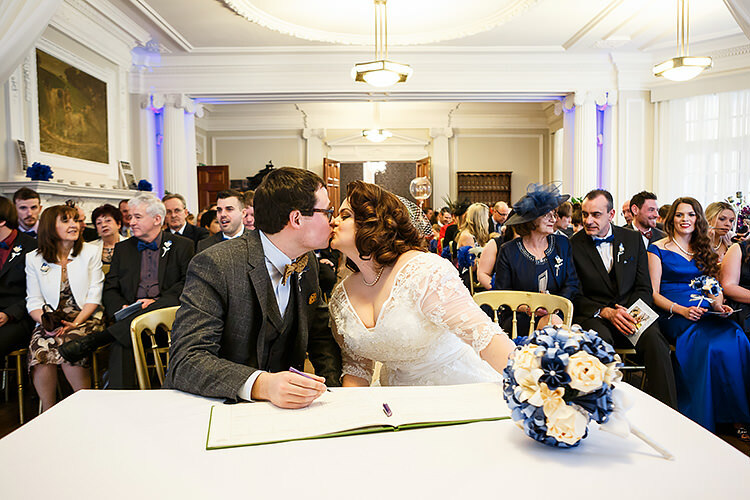 I had a bit of a wobble the week before because we didn’t have any fresh flowers in the venue, so Chris bought me a ‘night before’ wedding gift of a bright flower arrangement, which we added to the guest book table. THE CAKE | As well as being a beautiful maid of honour and awesome hen-party organiser (a vintage-themed day in a Cambridge hotel, featuring afternoon tea, a jive lesson, vintage makeovers and a mini-photoshoot), my sister is a fantastic baker, and when she offered to make our wedding cake, we jumped at the chance! 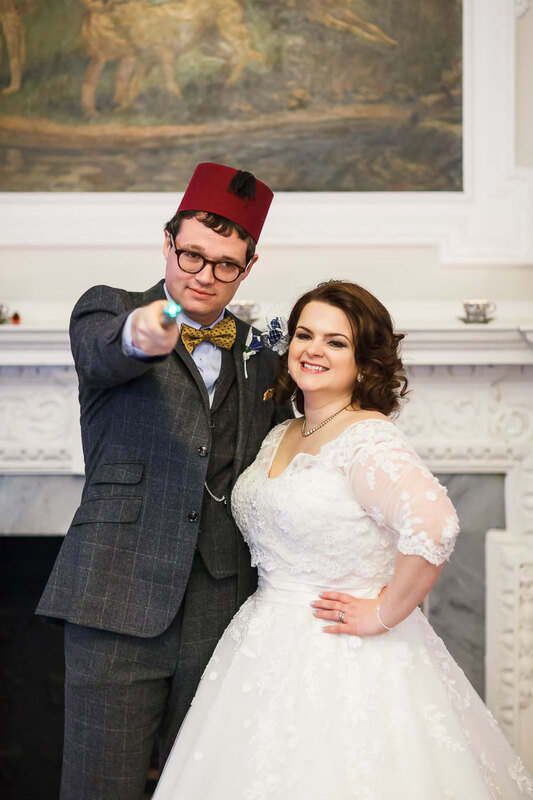 We gave her a bit of a vague brief of ‘Something a bit vintage, and a bit Doctor Who’, which we later pinned down to something very traditional, with a sneaky hint of Doctor Who. 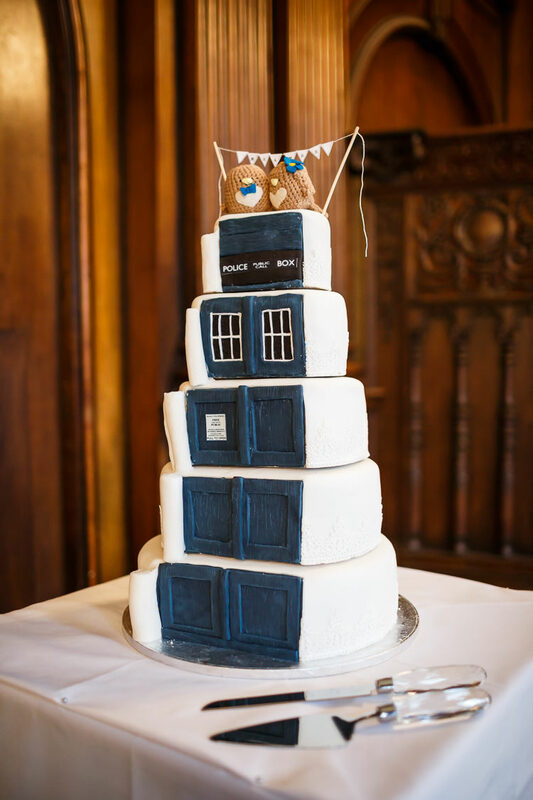 She did such a great job, with intricate lace work on one side of the cake, and a full TARDIS on the other. 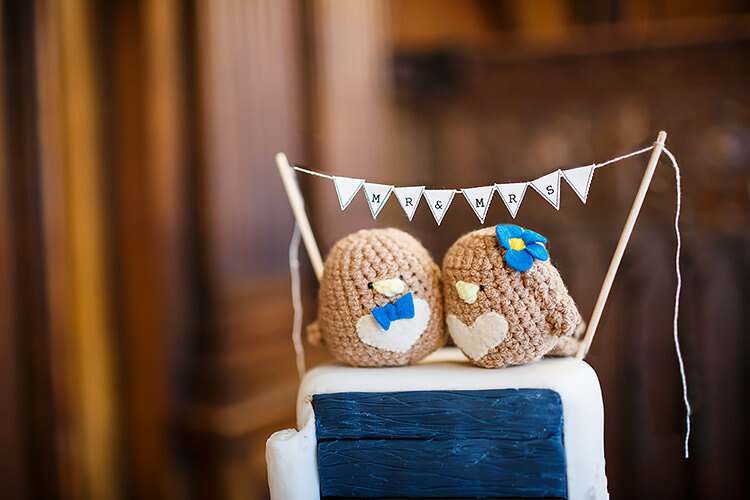 The gorgeous love birds on top of the cake came from The Pigeon’s Nest, with the bunting from eBay. 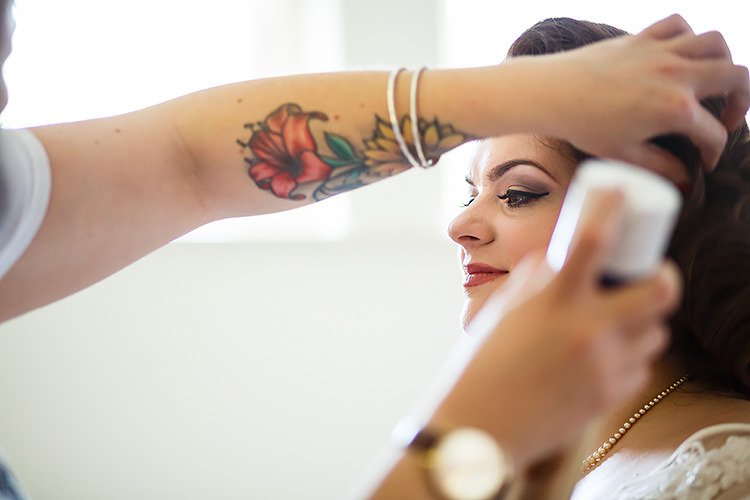 YOUR PHOTOGRAPHER | Our photographers were booked before we’d even decided on a venue! 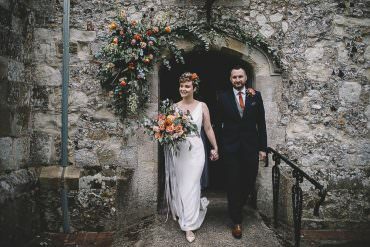 We first met Lina and Tom at a wedding fair, when we chatted to one of their friends and fell a bit in love with their photography style. 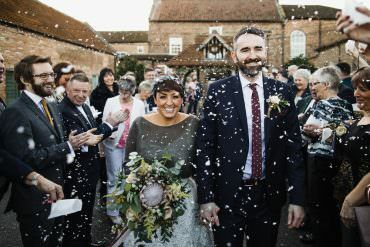 We then met up with them a few weeks later so we could get to know each other and see if we were the right fit for each other (very important when you’re having documentary-style photography), and got on so well we knew we’d found the photographers for us. 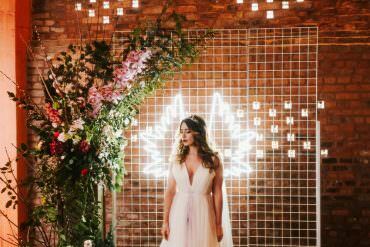 THE DETAILS & DÉCOR | Christopher likes to refer to our wedding as a vintage box filled with geekiness, which I think is a fair assessment. 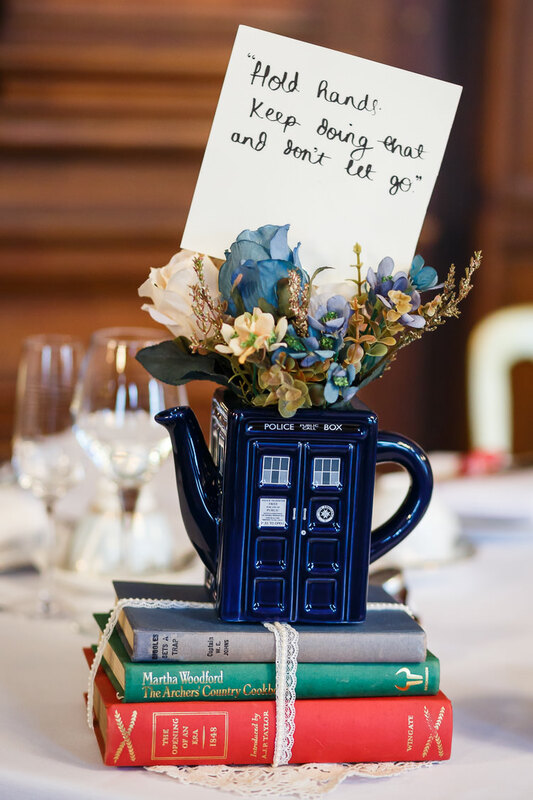 Our centrepieces were vintage books wrapped in lace, with teapots filled with blue and cream silk flowers – our top table, set for tea for two, had a TARDIS teapot. 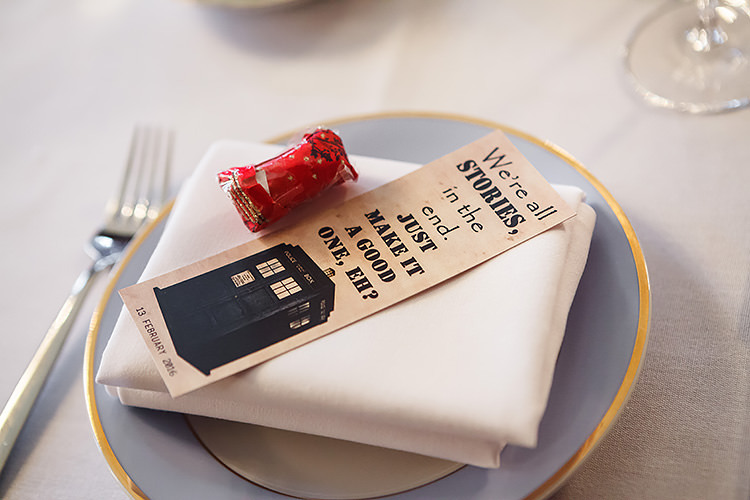 The wedding favours were vintage-style bookmarks with quotes from Doctor Who and our wedding date printed on them, and Christopher also painstakingly spent several nights the week before the wedding wrapping up individual Celebrations chocolates, in a reference to Gavin & Stacey, a show we both love. 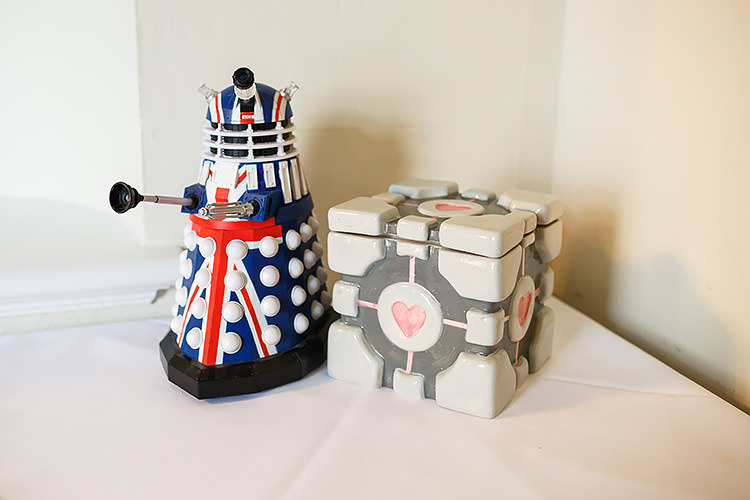 Each guest was also given a quiz that asked questions about the wedding – once completed, each quiz had to be put in a Companion Cube from the video game Portal. 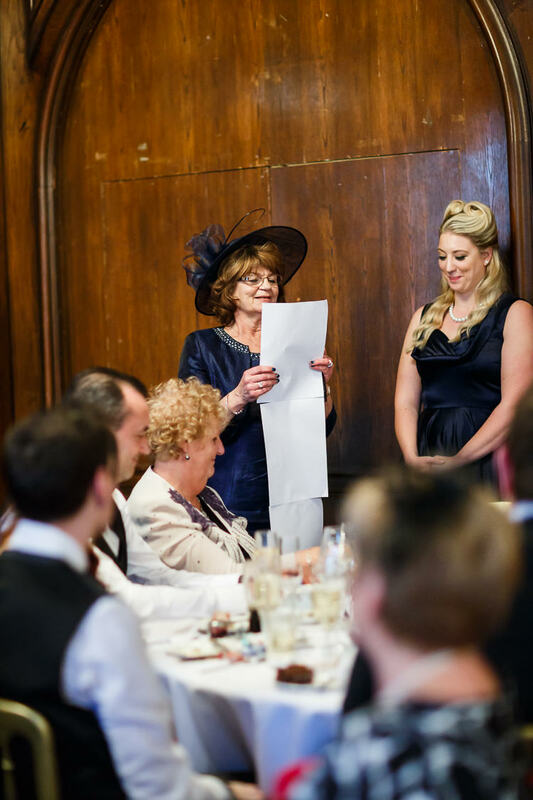 For our guestbook, we chose a replica of River Song’s diary, from Doctor Who, along with a sonic screwdriver pen, while guests could also sign our canvas, created by our good friend Lucy. 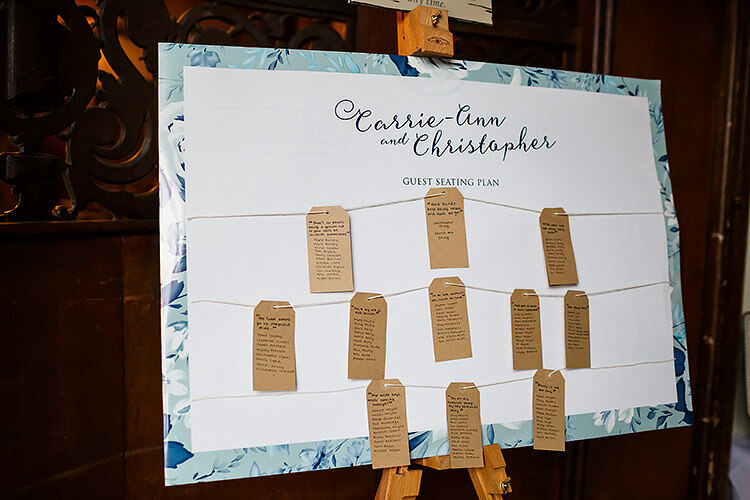 For our card box, we used a vintage suitcase, which belonged to Christopher’s granddad – I also had a photo of my granddad hidden in my flowers, a very thoughtful gift from my sister, along with one of his bow ties. 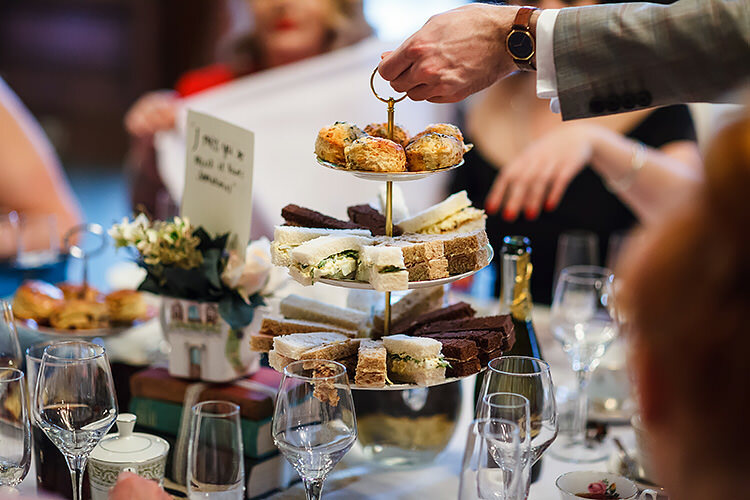 As we had a few hours between afternoon tea and the evening reception, we wanted to make sure we had plenty to entertain people with if they wanted to stay (although a few went back to their hotels to freshen up). 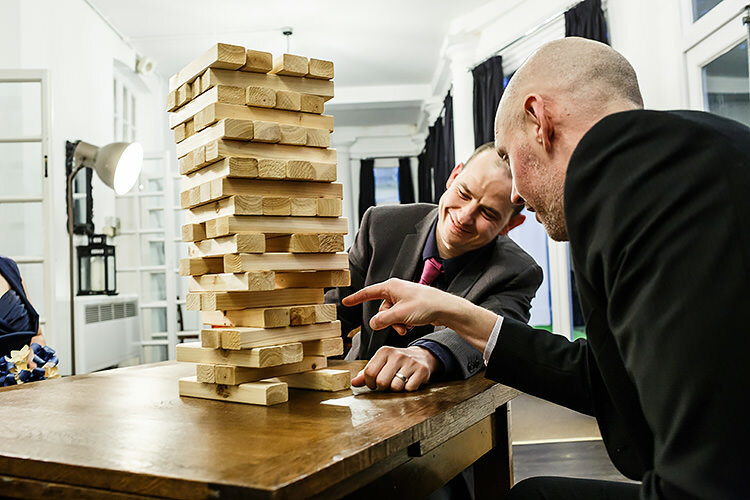 We had old-fashioned board games (which led to a heated game of Cluedo between some of the guests), with video game consoles and copies of Guitar Hero and Mario Kart for the more modern guest. 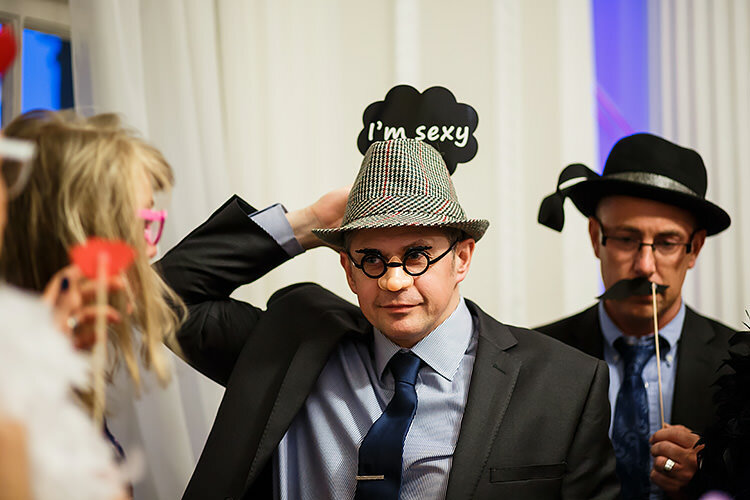 We also created a DIY photo booth using props and accessories from a local supplier, and Polaroid cameras, so the guests had something to take away with them on the night. So that people could keep warm if they fancied exploring the grounds (there’s a cave and everything), we also created a hot chocolate stand, which was pretty popular, as were the bowls of sweets that we had dotted around the room (I’m obsessed with peanut butter Lindt Lindor chocolates, which you can’t get in the UK, so Christopher decided to get some from the US just in time for the wedding – luckily he managed to grab me a couple on the day, as I was too busy talking). 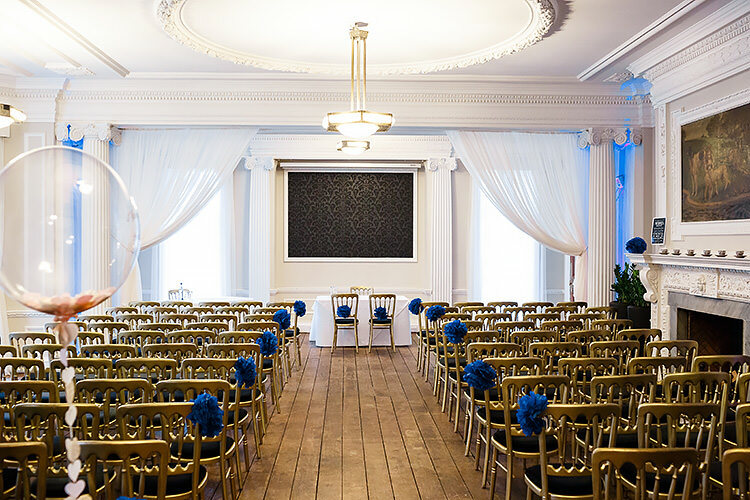 THE HONEYMOON | Straight after the wedding, we headed to Bath for a few days, which is a city we both adore. We’re planning on going on our honeymoon at the end of September, with a trip to Italy and Finland. MEMORABLE MOMENTS | There are so many! One of my friends – and honorary bridesmaid – staying with me the night before and letting me sing ‘I’m Getting Married in the Morning’ at her from 5am, having a special moment with my mum and sister while we waited for the car to arrive, two of our friends’ children following me around and straightening my train all day to make sure everyone could see it properly, one of the best men – who has a fear of public speaking – making the whole room belly laugh with his speech, watching my sister, glamorous gown and all, bouncing around to punk rock songs… there are too many to mention. I know it’s a bit clichéd, but the biggest highlight for both of us, I think, was looking around and seeing (almost) all of the people we love most in one room, and being able to celebrate with them. 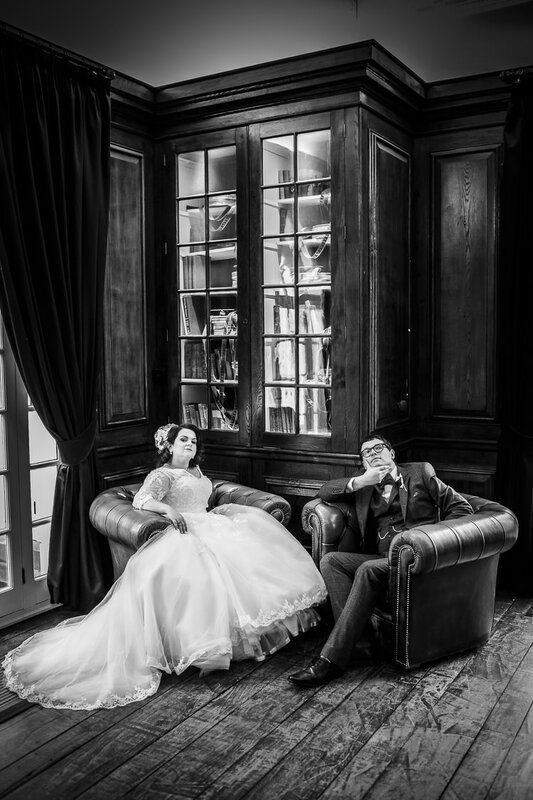 ADVICE FOR OTHER COUPLES | Plan, plan, as much as you can, but on the day, just let everything go and enjoy it. 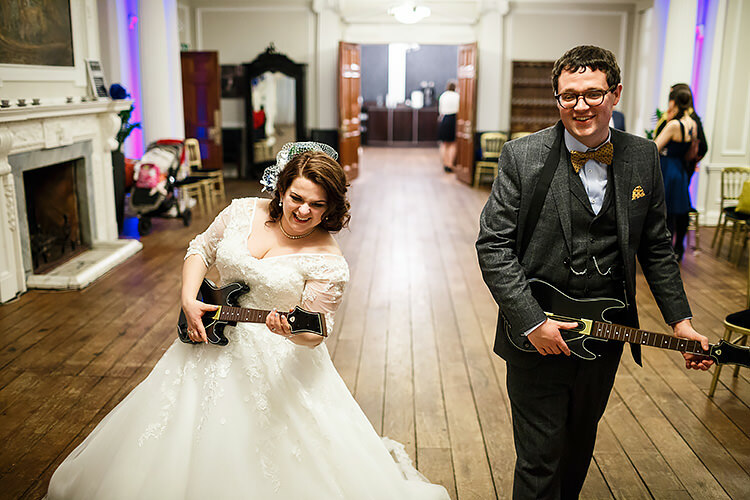 There were a few things that didn’t quite go to plan on the day (mainly around timings and music), but I was having so much fun that I just didn’t care! 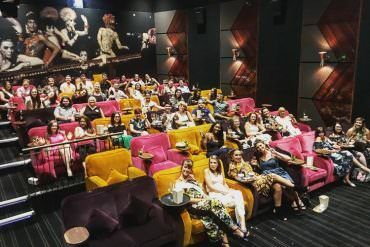 We’d also been told that we’d spend hardly any time together, but Christopher went out of his way to make sure that didn’t happen – most of the time, if we were mingling, we were doing it together. 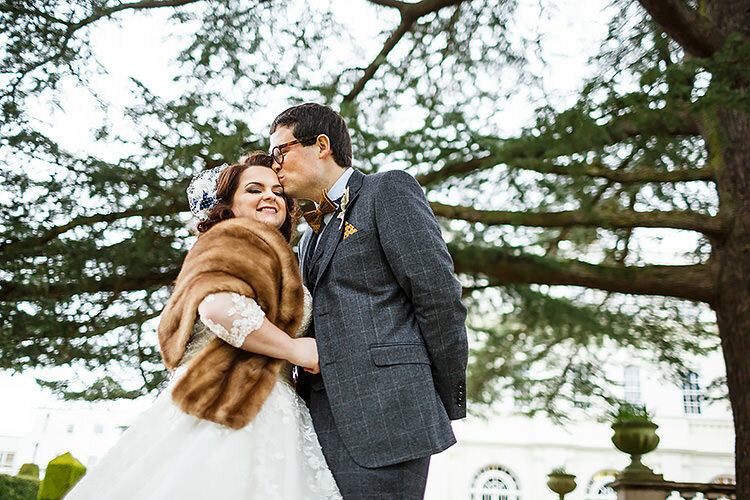 It’s hard, but it can be done, and I’d recommend taking a bit of time together – even if it’s only a few minutes while you’re having your photos done – to breathe, high five, relax, and have a good smooch! This has had in me in tears of joy! So beautiful and personal! The Doctor Who touches are fantastic! Well done on organising such an exquisite day. Now to find me one of those Tardis teapots…. 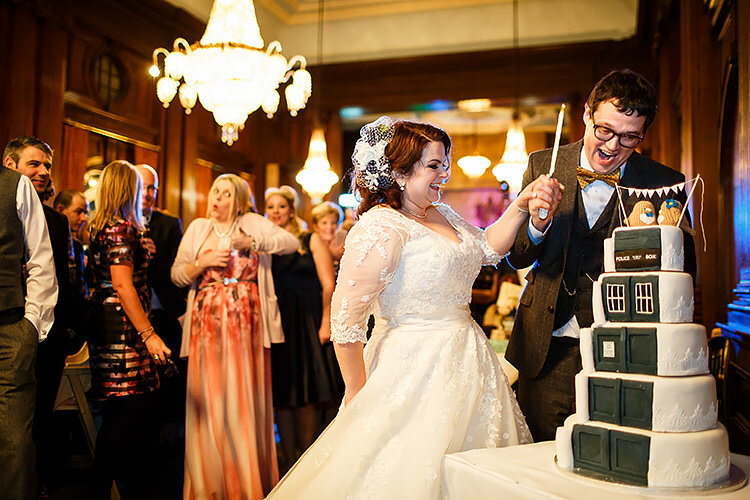 great wedding, cake is awesome!